Catch up on your reading without interrupting your day with the Audiobooks.com app. This useful app can be downloaded for a monthly fee and will give you immediate access to the latest books, lectures and more. 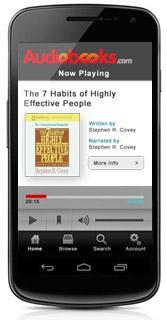 The Audiobooks.com app is available for iPhone and iPad devices. What makes this app different from others is that there are thousands of titles available for download. There is a monthly fee of $24.95 per month which gives you unlimited access to download books via the site. You can browse Audiobooks.com's selection of books by either category, best sellers or hot titles for the month. Expect to find books from some of the most popular authors, those on current best seller lists as well as those that are timeless classics. Whether you need a book for school, work or leisure, there is sure to be a selection to match your needs. In addition, you can browse television and radio shows as well as lectures. As a member of the editorial team for LoveToKnow Cell Phones, Audiobooks.com provided me with a free 30-day trial so I could check out the program. With the trial, was able to download several books to my iPhone. I found the app to be very easy to use. Downloading was quite simple and only took minutes for each of my selections. Once I downloaded books to my iPhone, I was able to access them via links to my saved books, as well as through download history. The app features standard play and pause buttons as well as ones that allow you to rewind or fast-forward though a selection. When you begin reading a book and move on to doing something else before finishing, the app will save it from where you left off last. You can sync the app to several devices with ease. In addition to browsing your books on your mobile device, you can play them on your computer as well. The selections that I chose all had narrators that were interesting and pleasant to listen to. I think that this app is great for those who are busy and want to listen to their favorite books while in the car or while working around the house. For one set price, you have unlimited access to thousands of titles, making it a great way to catch up on new releases as well as classics. While Audiobooks can be a cool app, paying a fee can deter people. The Audiobooks library is filled with plenty to stream but is not as large as some other ebooks sites. However, unlike many sites, Audiobooks does not have a limit on how much you can stream, a feature that can make up for the limited book selection. 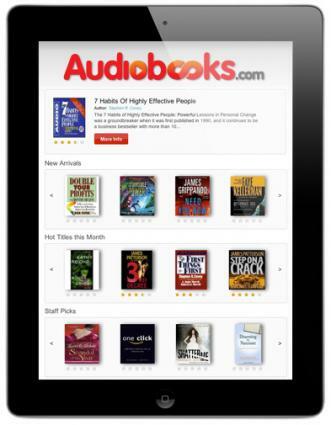 For more information, visit Audiobooks.com and discover what all this app has to offer. You can download the app at Audiobooks.com or at the iPhone App Store. To begin using the app, you will need to create an account and give a credit card to be billed for the monthly fee. You will then be able to sign in either on your mobile device or from a computer using your log-in name and password. If you are unsure about committing to this app, you can take advantage of their free seven day trial and preview samples or listen to a book. If you only need to download one book, you can do so for $19.99 rather than starting a subscription.